Earlier this week, I went to three different HEB stores on the hunt for what has now become my favorite peanut butter and a staple in my weekday breakfast. By the time I reached the third HEB it had started raining. Because I needed to just get one thing, I had my umbrella, phone, and wallet. I was in the peanut butter aisle, and then well mother nature called, so I grabbed my things, and rushed to the restroom. As I was speedwalking x2 I heard, "excuse me, miss. Miss, excuse me" I turned around and a teenage boy had my kate spade wallet. He looked at me and said, "You forgot this". I said "thank you" more times than I could count. I would've stopped to get his name but well, I needed to go! You see, when I grabbed my umbrella and phone, I thought I had everything because many times I'll just take my wallet and phone with me if it's a quick stop. I went back to the peanut butter aisle, and he was in the same aisle. He was there. I said thank you to him, and that was he did was really kind. He looked at me and said, "Anyone would have done the same thing." I was stunned, this teenage kid has so much faith in humanity he thinks anyone would have done that. Honestly, I don't know if anyone would have, but he did. 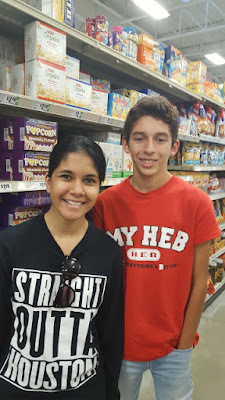 Meet Javier, he's a senior in high school, and works at HEB. He plans to attend a community college for 2 years and then wants to go into the Police Academy. Javier, keep working hard, being kind and respectful. I know you'll go far in life.